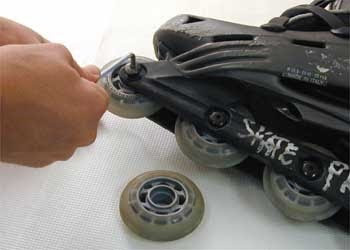 If your in-line wheels seize up or spin slowly and vibrate, they might need new bearings. Rust around the outside of the wheels and/or the sound of dirt grinding inside are also signs that it is time for a change. 1. Use an Allen wrench to remove the axle from the front wheel. 2. Pull out the front wheel. 3. Remove the old bearings from either side of the wheel. They should pop right off if you use a bolt or something similar. 4. Place new bearings on either side of the wheel. If necessary, use a flat surface for extra leverage. 5. Place the wheel in the wheel frame. 6. Use the Allen wrench to replace the axle. If your spacer is aluminum, tighten the axle bolts as far as they will go. If your spacer is plastic, tighten the bolts as far as they will go, then loosen them slightly. 7. Spin the wheel to see how easily it rolls. If it doesn't spin freely, loosen the axle. If it wobbles, tighten the axle. 8. Repeat the steps for the remaining wheels. Bearings made in Switzerland have the best reputation, or at least those bearings labled as "Swiss Bearings". There are many Bearing Distributors At LA who use the term "Swiss Bearings" and supply skate bearings in wholesale price. So, before placing your bearing into the cart just make sure that you have chosen the right size. Consult the manufacturer's instructions for information about your specific type of skate. If you skate through water or sand, you'll want to change your bearings every year. If you cover terrain that isn't as rugged, change the bearings approximately every three years. 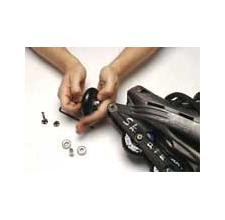 Select proper size and high performance skateboard bearing every time you change. For replacing your bearing I would recommend BearingsDirect . They supply high quality bearings in affordable price, where normal people can easily afford it.